This thead has been set up in response to requests for chopper wiring information. What follows is an attempt to make wiring your chopper understandable, and I'll say from the outset that I am not a motorcycle electrician... and you don't need to be either... just wire up your bike and ask questions as you need to. 1. Power storage... Your battery stores and provides 12-13.5 Volts DC (direct current) to the various systems requiring elecrrical current. Electrical power for your chopper is a flow of electrons (a bit like water flowing) called current. The electrons (current) will only move if a "tap" (switch) is opened and they can move in a circuit from the battery positive via the item requiring the current (eg tail light) and then back to the battery negative. Wires feed the current to the item. The item is usually "earthed" to the bike's frame which carries the current back the the earthed battery negative terminal. Broken wires and dirty or corroded connections break this flow or continuity. So... 1. keep connections clean, 2. do not stretch wires, 3. place your electrical components where you cn easily get to their terminals. Many a biker has languished on the side of the road due to a dirty connection or because he has to pull the bike to pieces to get to an offending connection! Just to confuse you, most Triumphs circuits are the opposite and the battery positive is earthed. But as long as a circuit can be completed, the current flows. Buy yourself a cheap multimeter for checking voltage and "continuity." A broken wire or dirty connection will not show continuity. You can also check globes. Attaching MM leads to side and pin should show continuity. You can check switch operation too. 2. Charging circuit... Your generator (usually mounted in front of the motor) provides direct current to keep your battery charged. Voltage is regulated by the voltage regulator. If your chopper has an alternator, it produces alternating current which the rectifier converts to direct current. The rectifier acts as a voltage regulator as well. The alternator (mounted on the end of your crankshaft) produces more electrical current (needed for modern bikes with more powerful lights and extra electrical accessories) than a generator. Alternators can be permanent magnet or electro magnet. Wiring diagram above is for permanent magnet alternator (eg HD). An electro magnet set up (Honda CB's and Yammy XS's) needs an exciter wire. This runs off ignition switch/fuse (when switched on) to the regulater and then to the alternator. An alternator in good nick will produce 13.5-14.5V. With your bike running at 1500 rpm you can check this with your multimeter across the +ve and -ve terminals. 3. Ignition circuit... Your battery supplies current to your ignition coil. A high voltage (40000+v) surge to the spark plug is induced in the coil when the circuit is broken. This is done at the points. The condenser which attaches anywhere between the coil and points prevents a strong destructive arc at your points. 4. Lighting circuit... Battery supplies power. Ignition switch ususally has a second position for lights... or you can have a separate switch. Current from the light switch goes to the tail light, the globe being earthed to complete the circuit. If the light holder is rubber mounted, you will need an earth wire to the frame or back to the battery earthing point. Current also travels to the high beam/low beam switch and then to the globe holder in the headlight. Looking at the headlight globe from behind, the low beam is the top blade and the high beam the right. The left blade is the earth. Aftermarket "Bates" headlights have an indicator globe in the headlight shell that connects to the high beam. 5. Brake circuit... Current to the brake light is "made" and "broken" by the brake light switch which is operated either mechanically by the brake lever or if a hydraulic brake is fitted, by a switch in the brake line. ADR's don't require a front brake light until 1995 I think. 6. Horn... In most modern horn circuits, the current runs via the horn button on your handlebars to the horn which is earthed. the horn's sound is produced by a vibrating plate. The sound can be adjusted with a screw and locknut. On jap horns you will need to lever off the cover. With older horn circuits, the current runs via the horn to the horn button which earths the system when pressed... not aways reliable! A mate used to have his horn and button hidden, but a bulb horn on display. The coppers would get quite irate and be about to book him when he would then feign sudden understanding and hit the hidden button... told us it used to drive them crazy! 7. Fuses... Preferably, have a fuse on each main circuit after the ignition switch. Reason is that if you have a short you can more quickly find the fault, because only the fuse in the faulty circuit will be blown. 10 amp fuses are fine for all the circuits shown. Electric start circuits need a 15 or 20 amp fuse. On the diagramme above, I've shown a separate fuse for horn and brake light... not necessary... run them off the same (accessories) fuse. 1. Oil pressure switch... current flows through the circuit while oil pressure is low. When oil reaches pressure, pressure switch (sender unit) opens and breaks the current and the lamp goes off. 3. Starter Circuit... If you run an electric leg, you need a much more substantial (and weighty and expensive) battery. The battery suplies current to the starter solenoid and the starter motor via a heavy cable designed to take the high current draw of those two items. 4. Turning indicators... in the seventies the first casualty of chopping. ADR's now require indicators on later bikes (not sure if post 88 or 95) Different states have their own rules on this so check your state authorities it you want to stay legal. The circuits above should cover your wiring needs for most bikes. On my first projects, I used the wiring diagramme from my manual and deleted every wire I didn't think I needed. Then I drew up my own diagramme keeping wires as direct as possible. Now, understanding the circuits, I basically draw up a diagramme from scratch, cross checking when there are such luxuries as electronic ignition and starter circuits. Below is how I started with Michael's 82 Sportster. 2. Keep routes as direct as possible. Stock bike wiring looms are designed for efficiency on the assembly line only, hence the headlight full of wires and connectors and 6' lengths of wire that connect components 6" apart etc etc etc ad nauseum!!!! Ignition switch... If the ignition switch is not central, I add a "kill" switch in to the system so I can switch the bike on or off with either hand. Sometimes you will pull up with your hand on the clutch (cos you can't find neutral) sometimes on the front brake (cos the camber is very steep). Last edited by Prof on Sat Mar 24, 2007 11:34 am, edited 5 times in total. This is a link to an article on my site, it's an attempt to demystify the whole wiring thing. Excellent..thanks Prof, wiring is the one thing I can't get my mind around!Couple of questions..wire amperage..is 15 the go for all circuits? When you say Triumph is positive to earth is that in all circumstances as in a new bike off the floor & when doing rebuilds or can you change to negative to earth. Appreciate your help. Skip... I use 10/15 amp wire for all runs except genny/alternator to battery and from battery via kill and ignition to fuse cluster. For these I use 50 amp*. Modified 10/6/07. I went to local Auto Pro and measured their wiring so what I called 20amp is actually 50amp. I pull older car wiring looms apart for my wiring as they have such a variety that I can have a different colour wire for every run. Some Triumphs are negative to earth. To change positive to earth polarity, I belivee you have to have alternator rewired. There is no problem with positive to earth at all ... except you can't run an after market mini tacho... they are only available in neg to earth. Wiring is really simple, just a case of some study so you get the hang of each circuit... same as anything ... just spend some time mucking around with it and you'll get the hang of it. Black Jack... Thanks for your link, I've added it into my post. Honda chopper also provide wiring diagrammes for Hondas. However, my intention with this post is to set each circuit out so you see how simple it really is and understand bike wiring. When you understand what you are doing you have much more success trouble shooting out on the road. You also have more confidence in your own chopper and you feel darn good too! 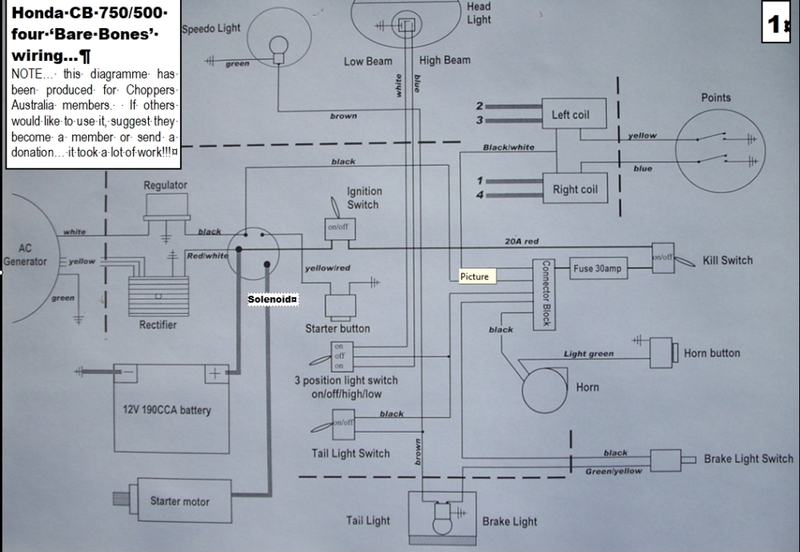 Here is a basic wiring diagram for CB750's and CB500's. 1. CB alternators use electro magnets ie they need power to initiate charging. Like XS650's there are therefore two wires to alternator form the ignition system. One is the charge wire (red) from the rectifier. The other is usually a black wire that provides power from the ignition (fuse or connector block) to the starter solenoid and then to the regulator. This initiates the alternator when t he ignition is switched on. 2.The other wire from the starter solenoid, yellow/red in this diagram completes the starter circuit when the stater button earths. Note that wires to solenoids can be different colours depending on the model or source of the solenoid. 3. Lights If you use a key switch with an on position and a lights position, you can combine the two switches shown in this diagram. I prefer to wire this way, so I can run head light at dusk without taillight so my brake light shows up better in traffic. Don't wire your lights to come on with ignition, because the headlight causes a big drain when starting and if your battery is a bit low you need all the power you can get. If your alternator packs it in on a ride, your battery will run the ignition for a day if it is in good nick. With headlight on it will flatten in less than an hour. With out having to run lights you can still power your coils down to about 6V and still get home. 4. Only one fuse is shown in this diagram. I prefer three; ignition, lights, accessories (horn, brake light etc) See earlier diagrams on individual circuits.